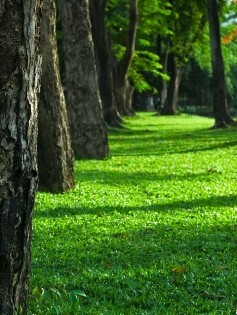 If you really have a densely shaded area where it is difficult to get grass to grow, this is the only choice you have. If this doesn’t do it, you have two choices… cut the tree down or forget about having grass! Shady Grass® seed is a mix of the most shade-tolerant grasses that are available. This shady grass seed mix is predominately fine fescue, with just a small amount of poa trivialis and perennial ryegrass. Shady Grass® seed is not designed for full sun environments. An important point to remember about this product is that it needs to be allowed to dry out. Most irrigation systems will water both the sunny area and the shaded area at the same time. As a result, the shaded area never gets to dry out which creates an anaerobic environment, making it difficult for the grass to survive.